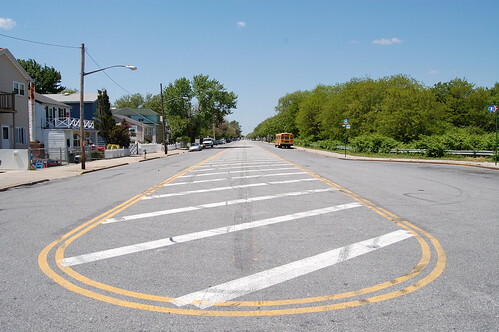 Back in September 2005, the Department of Transportation in order to calm traffic, reduced the number of travel lanes to one from two on Gerritsen Avenue between Avenue W and the cul-de-sac at the southern tip of Gerritsen Avenue. The posted speed limit was reduced to 25 mph from 30 mph. Installation of supplemental signs and markings in front of the Gerritsen Beach Public School / PS 277 (between Avenue X and Bijou Avenue) to better define the drop-off/pick-up area. In total, 67 new signs were installed along the corridor. These signs included new â€œStopâ€ signs, â€œSchool Crosswalkâ€ signage, oversized â€œOne-Wayâ€ signs, â€œDo Not Enterâ€ signage, and other traffic control signage advising motorists of roadway conditions. Overall, the daily average speed in the northbound direction declined by 9.9% to 28.6 mph from 31.6 mph, while the 85th Percentile declined 11.7% to 34.0 mph from 38.5 mph. In the southbound direction, the daily average speed decreased by 11.9% to 26.9 mph from 30.5 mph, and the 85th Percentile Speed declined by 13.2% to 32.3 mph from 37.2 mph. Certain portions of the corridor such as from Devon Avenue to Florence Avenue experienced more significant declines than the other sections, however all segments showed a remarkable decline in speed. Traffic has slowed down and the Ave. is safer. If this did not work the DOT was going to put up concrete barriers in the middle of the Ave. instead of paint. There will be Green Streets soon, a center median, with a garden, grass maybe some trees and bushes. What is needed at Florence Ave is a STOP LIGHT. I remember being at a Gerritsen Beach Property Owners Association meeting with the DOT in attendance. The people with the DOT were smug, arrogant and downright disinterested in the needs of the community at large. Manhattan Beach had gotten a stop in an area like Gerritsen Ave, the DOT could care less about the people in Gerritsen Beach. What I would love to see are the minutes of the GBPOA meeting posted online, if for no other reason to keep the community informed. If I start a property owners website, that will be a feature. I would like to know who did this study on the speeds. I am on Gerritsen Avenue everyday and I have witnessed half this community speeding (at higher than the posted 25 mph) up and down this avenue. How can they state the speeding has declined, because it hasn’t declined one iota. This study needs to be done with someone who is willing to be honest about this situation and not worried about losing their jobs if their reports contain the real facts of what is going on here. I agree the DOT and Marty Golden do not care about this community. I find it very funny how you can drive down certain communities and there are street lights on almost every corner, and speed bumps ( which we know won’t work for us. The kid’s would use them to jump there car’s and become airborne). So far the so called solutions by the DOT have been nothing but a huge waste of money and has caused additional problems with regards to the safety of cars going into Gerrittsen Avenue and leaving Gerritsen beach. There is no space for cars to pass parked cars with a degree of security. Why is the simple and best solution for the traffic problems in Gerrittsen Beach, which is TRAFFIC LIGHTS, being totally ignored by the powers that be? I would also like to add that all the parent’s that double park by P.S. 277 force people to go around them into the zebra strips, which forces them into on coming traffic. There has been many serious mishaps due to this situation. This problem has only occurred since the DOT has installed steal cones ( which have been hit several times and had to be replaced) and zebra strips. There is plenty of parking on whitney avenue and the side streets , where these parents can park there cars instead of double parking. I believe a patrol car should be stationed outside the school during the morning and at 3 p.m. issuing tickets to each and every double parked car. So we the community can drive pass the school during these hours in a safe manner. I agree with Michael P Judge, I’d love to see the minutes of those meetings available, my work schedule doesn’t allow me to attend the meetings.